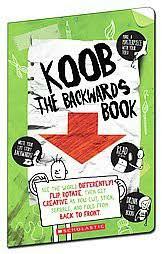 Our older son's school just had a Scholastic Book Fair and we came across an interesting looking book called, Koob: The Backwards Book. We both read the title and quickly tried to figure out how to start reading the book... It was a fun challenge just getting this step done. Koob is not like any other book you've read... because it's a backwards book! The book will challenge it's readers to think outside the box and use different skills to get through each page. We worked on the first few pages as a family because it was so much fun... and ended up creating a great family bonding night. One page had each of us write our names backwards with our non-dominant hand, each letter also had to be written backwards (I could feel my brain working). We were laughing so hard! This book tells its readers to glue, cut and ruin pages... seriously entertaining! If you have kids in the 7-10 year range (really any age would enjoy this) I highly recommend picking this up! Hurry and purchase soon as there is a coupon available.